Watch parades on Main Street from your balcony or view the beautiful Bridger Mountains out your over-sized, arched windows. This two-bedroom, one bath, and two-story atelier is a great place to call home! Located on the south side of Main Street in historic downtown Bozeman, nestled above restaurants and specialty shops, the Atelier Above Main puts everything at your fingertips…and the great outdoors is just steps away! The darling kitchen opens up to a cozy living room, equipped with everything you need for a short or extended stay in the beautiful Gallatin Valley. The kitchen is fully appointed with refrigerator, dishwasher, range, microwave, two sets of dishes, lots of glassware and silverware. The great room has a seating area, an entertainment center and drop leaf dining table for four. There is also counter seating for three. The bedroom on the main level has two over-sized arched windows overlooking Main Street. It is comfortably furnished with a king-size bed, an Americana quilt, nightstand, alarm clock and layered window coverings. The bath is on the main level, as well the shower, sink with large vanity, toilet and double sets of towels. The full size stacking washer and dryer are located across from the bathroom. Upstairs is a large suite facing south, creating a very private and quiet area. The bedroom is furnished with a Mission style king-size bed with 300-thread count Egyptian cotton sheets, nightstands, and dresser. There is a great TV, with a comfortable chair to snuggle up in. This lovely bedroom has a window facing south, and a skylight to provide the perfect ambiance for restful nights. - Full kitchen, refrigerator, dishwasher, coffee maker, microwave, toaster, cookware, dish soap, dishwasher, and dishwasher soap. - Table with leaf insert to seat four. - Three stools at bar for additional seating. What a great unit, we always love staying here. Love being able to walk for dinners and shops right on main street. Even had some wine on the deck because the weather was so lovely. We also loved that you now have a concierge, as Joseph was very helpful with booking our restaurants. Blackbird is a great restaurant. Looking forward to my next visit! 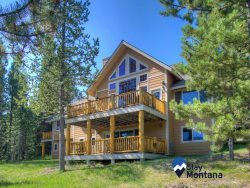 The apartment is in the heart of Bozeman and had all we needed. The rooms and furniture were comfortable and kitchen had all we needed. Most of all, the location was great. We loved walking out our door and into the middle of town. This was the perfect gateway to Bridger as my son, his fiance were visiting my other son who lives in Bozeman to Ski. The cold smoke was great! Zach and Sarah were very helpful and made my stay more enjoyable. A special apartment, cozy, with excellent amenities, fabulous location in the heart of downtown. It felt like home on a cold, snowy weekend. I can't wait to come back with my family, (so happy that it is pet friendly), and I would highly recommend this place to friends! We had a wonderful 3 night stay! What a great place to stay! Great location! Cute, clean and comfortable! I would differently stay again! Great location, loved the balcony for people watching! Lots of charm! A great location for downtown activity and community involvement. Super clean, extra comfy beds, great location... Visiting our daughter who just moved to Bozeman. Loved the place! Will definitely make this our "home away " whenever we visit her. Great find in beautiful Bozeman visiting our daughter and her boyfriend who just moved here. We'll make this our home-away whenever we visit them. Beautiful space to stay during our trip to Bozeman! Especially enjoyed the balcony for music on main! We'd love to come back again! Thank you! Perfect place to "Stay-N-Play" in Bozeman. Came here for a wedding weekend - beautiful! Easy walking from food and bars. Clean and comfortable, cute and cozy. Thanks, we'll be back!